Memorial Park, located on the northeast corner of N. Denny St. and E. Kosse St. The park features a pavilion with playground equipment and picnic tables. A.M. Ferguson Park, located at 401 S. Hughes was established in 1971 as a baseball field for ages 5 through 8. Bicentennial Park, established in 1976 and located on the west side service road of southbound US 75. This 5-acre park contains two baseball fields and a practice t-ball field. Kids ages 11-14 utilize the north field while the south field “Hash Field” is for ages 9-10. Howe Youth Softball Complex, located at 200 E. Davis is a joint-partnership between the Howe I.S.D. 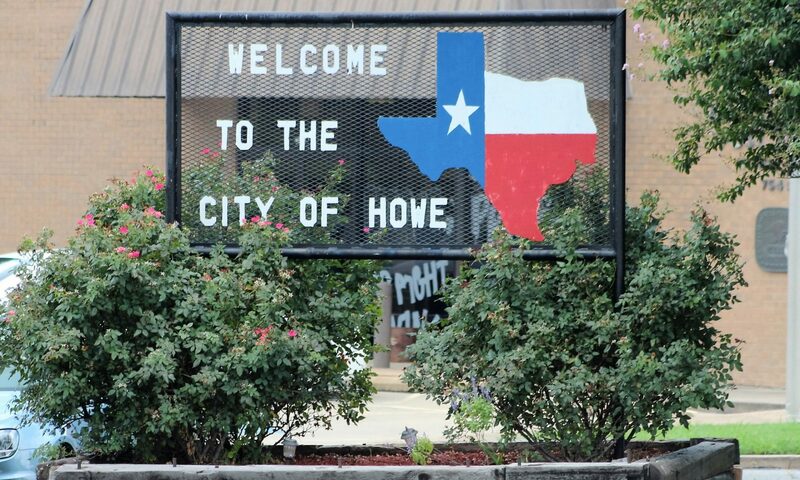 and the City of Howe. The park contains two large softball fields for all ages for the Howe Youth Softball organization. Reed Park, located at 1000 Swanner Dr. and is a community park with swings, slides and picnic areas. Summit Hill Park, a newly dedicated park to the City of Howe from LGI Homes for the new subdivision called Summit Hill. The park offers a gazebo and park benches under beautiful shade trees. Casey & Dot Jones Park, Plans are underway to construct hiking and biking trails as well as tennis courts along with baseball, football and soccer facilities. The city has applied for a grant that will help kick-start the development of this park into a center of recreational activities.